Happy Monday to all! Here’s to hoping your meteorological conditions are a bit more pleasant than mine! I swear, this Louisiana Summer WILL be the death of me. It’s “89 degrees” outside, apparently. Who do they think they’re fooling? I have pretty much come to the conclusion that the weather man, my iPhone, and car thermostat are all trying to pull one over on me, because it certainly does NOT feel like any measly 89°. It’s got to be at least 100°… maybe that’s a stretch?… I’m just not one for the heat. Don’t get me wrong, I love relaxing in the sun and getting my tan on with a cold beverage in hand, as much as the next chick, but that is not the case here. The case here is that of a million tiny dragons blowing fire down my back, to the point where I am seriously considering shaving my head in the hope of catching a cold breeze. I know, I sound like a dramatic cry-baby…I will survive. Hopefully. About a month ago, I was approached by a real estate agent/friend to stage a home for a client of her’s. Said client is a home builder who’s house was to be featured in this years Northshore Parade of Homes. I was tickled pink at the opportunity, so I jumped right in and got after it! Shortly thereafter, a second home builder (who’s house was conveniently located next door) decided he wanted his home to be staged as well. Nothing I can’t handle! 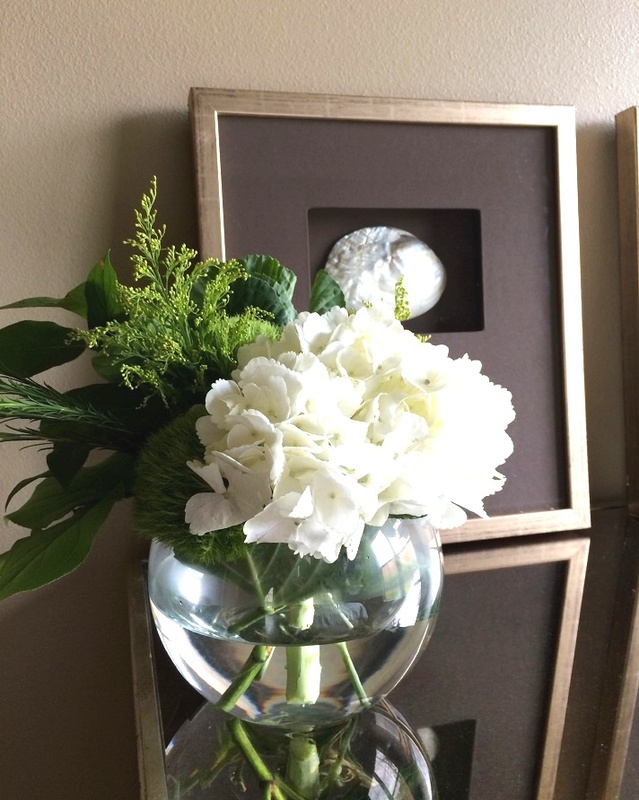 It is important to remember that staging is an entirely different ball game than decorating. With every piece of furniture that I brought in and each individual accessory, I try to constantly remind myself of the final objective. That objective is not for the décor to be the focal point, but instead for the décor to enhance the space and draw the buyer’s eye around the room. It is my job to showcase the fine details and beautiful work the builders put into their homes so that they sell promptly and at a good price. Without further adieu, let me walk you through both houses I staged in this year’s Parade of Homes! 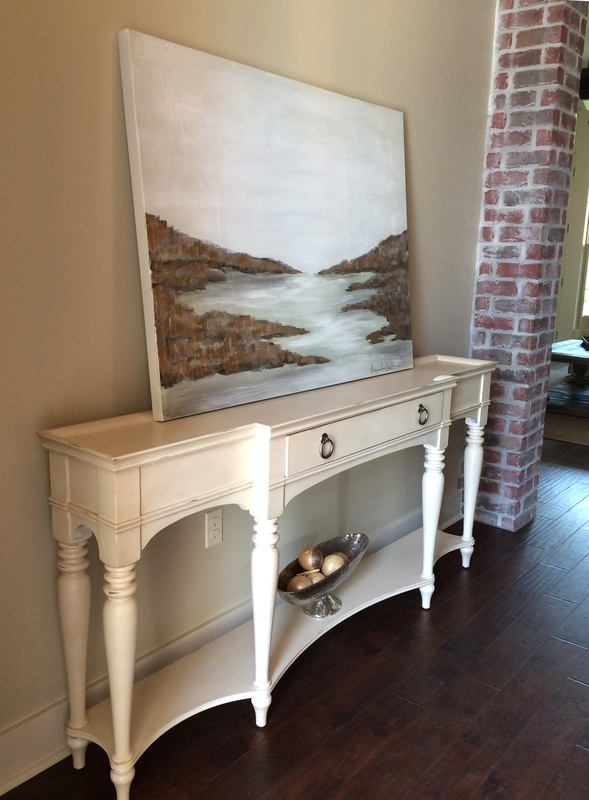 Staging a foyer with fine art graciously donated by local artist, Ms. Alexandra Drake. 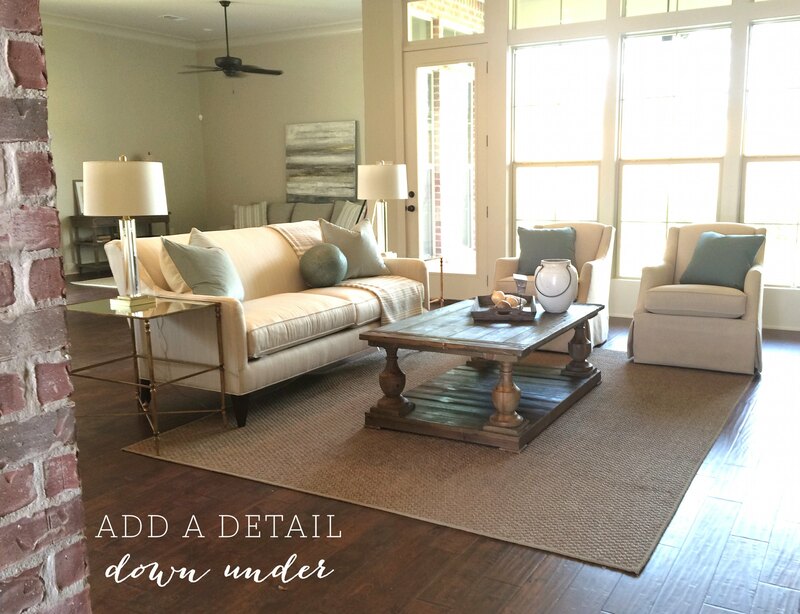 Think BIG when it comes to area rugs. A small rug in a large space with just get swallowed up and make the room appear smaller. For the living room, I opted to bring in neutral furniture in keeping with the builder’s color scheme. 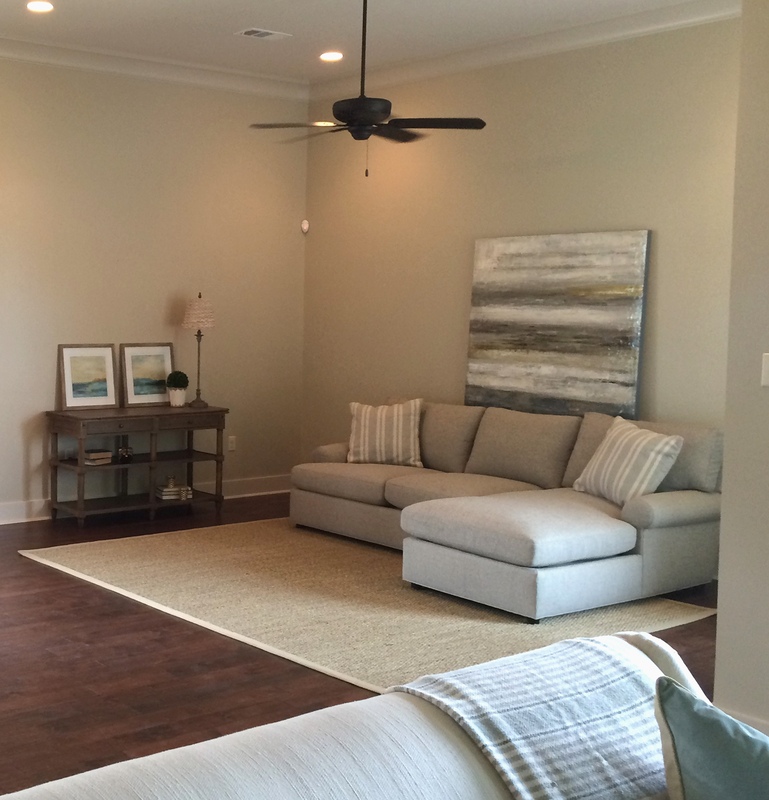 A general rule of thumb for staging is to stay neutral, as it appeals to more potential buyers. I added a simple, jute area rug under foot. It is large in scale, so it anchors the room and defines the space without distracting the eye. Lean if you need to! To avoid adding tons of nail holes, just go with “the lean” for art. This area is the keeping room. Typically the furniture will face the far wall (with the large painting). Hidden behind the large, abstract piece are cable and T.V. hook ups. 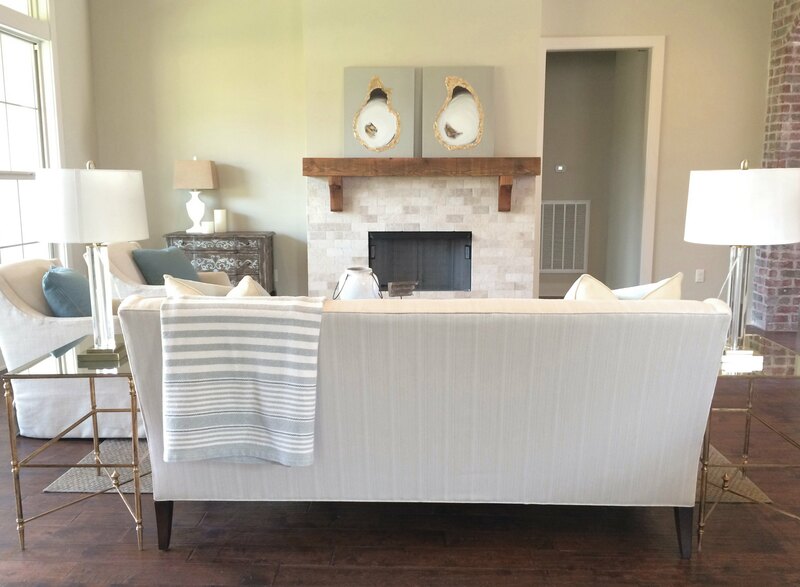 For staging purposes however, I opted to place the sofa on the far wall in an effort to keep the space open and feel more inviting to buyers. 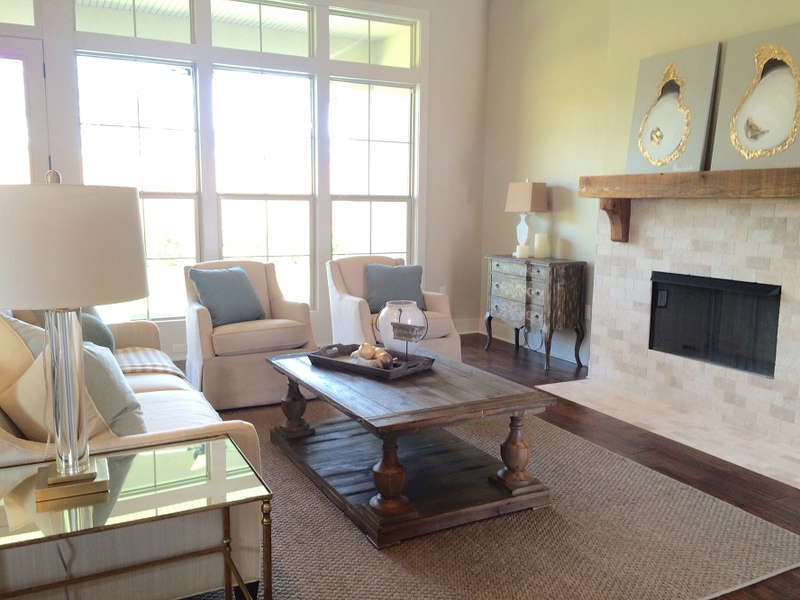 *TIP* Whether you are staging a home for photos or a showing, light it up! The brighter the better! So open up all shades and curtains and turn on as many lights as possible. 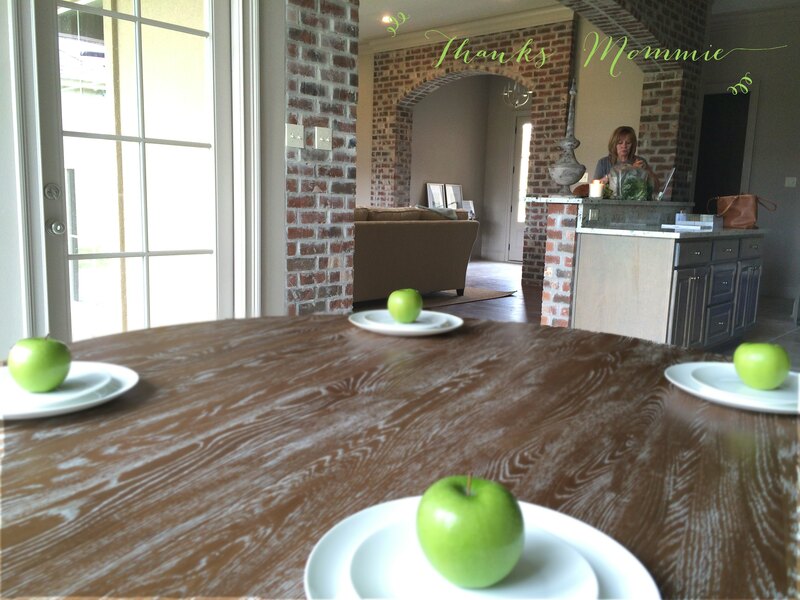 Believe it or not, it is actually more cost effective to purchase fresh fruit for staging as opposed to artificial. 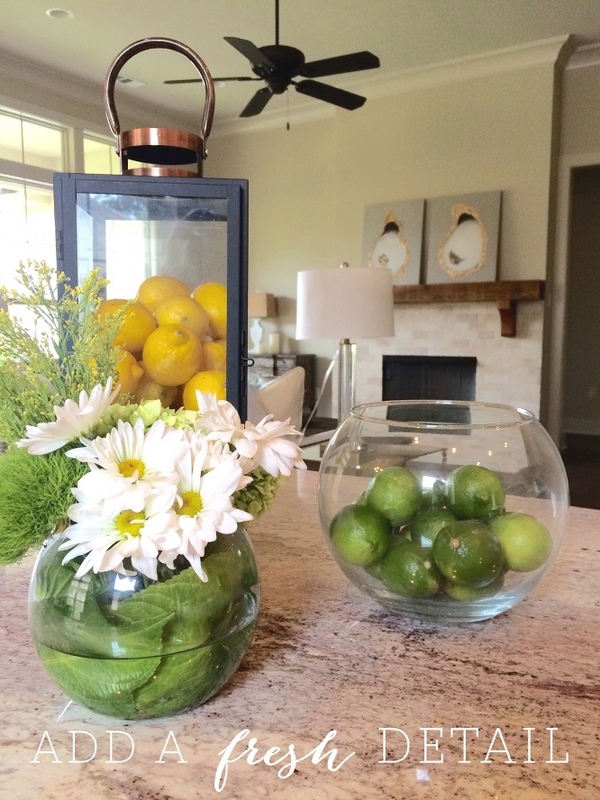 When staging homes that are brand-new, it is important to bring in items to make the house feel “lived in”… That can be fresh-cut flowers or a bowl of fresh produce. 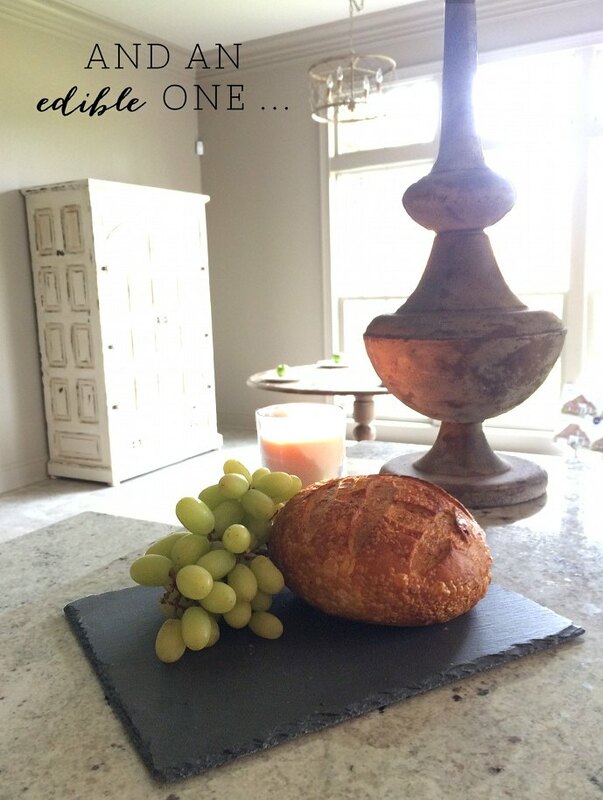 Get creative while staging a dining table… Edible options are a fun alternative. *Added bonus: they get tossed away when we’re done… instead of having to be wrapped up like their breakable friends (plates). 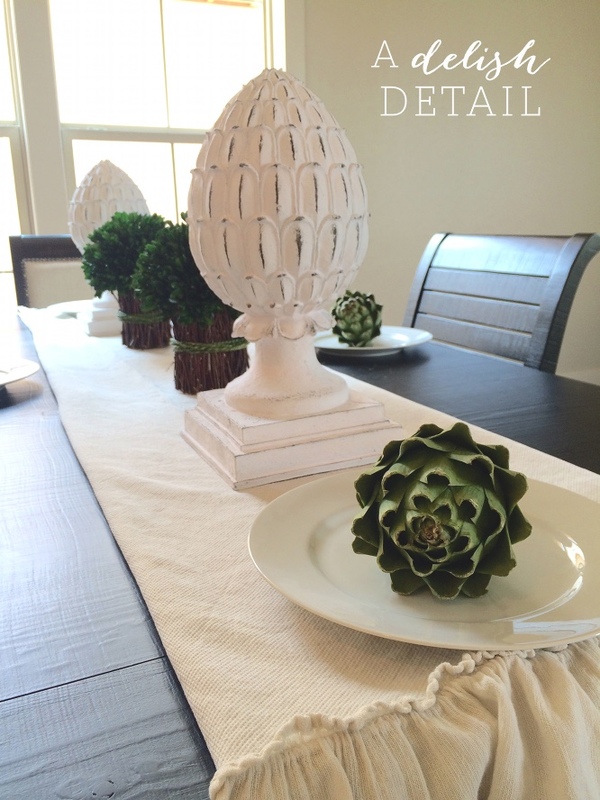 When it comes to staging the dining table, I like to add a bit of visual interest. I definitely want to steer clear of over-doing it because that can be distracting. With this table, I kept it clean. A simple runner, decorative finials for height, boxwood bundles for color, and easy white plates give an uninteresting table life (that potential buyers could serve supper on). Mudrooms are the perfect opportunity to have fun. They are not as “serious” as a formal foyer, so live it up when staging this space! 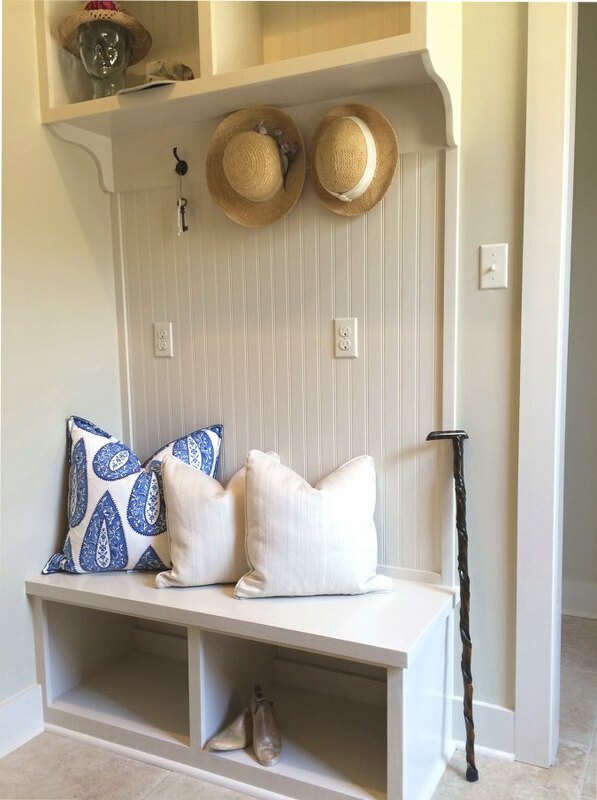 How fun is this mudroom?! 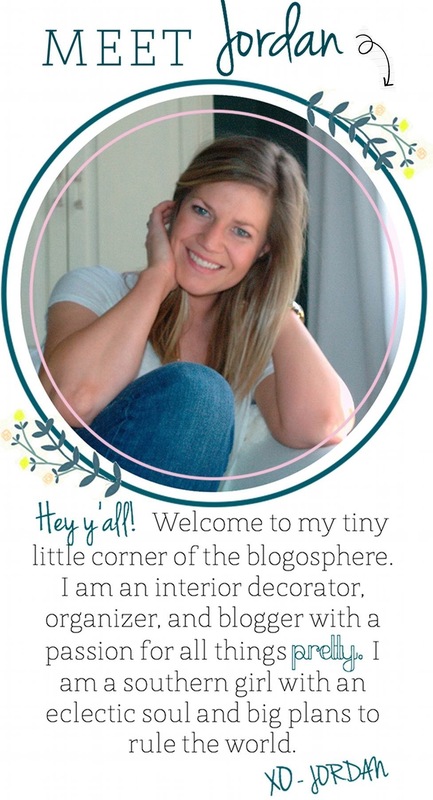 It would be a shame to leave this space bare… SOOO I went to town adding straw hats, skeleton keys, throw pillows, and an adorable walking cane. In the mudroom, the builder added this little office nook. 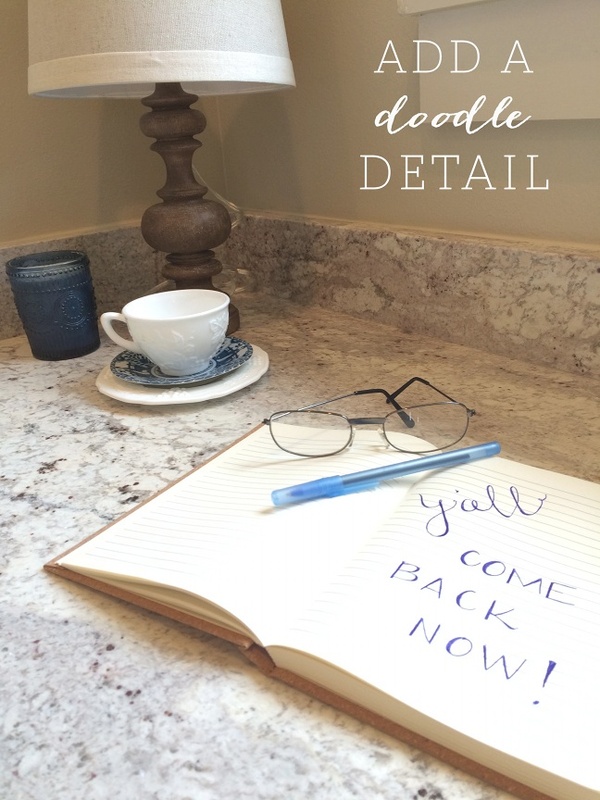 A small lamp, cup of tea, and a notebook transform a cold desk into a cozy niche for anyone’s grocery list endeavors. 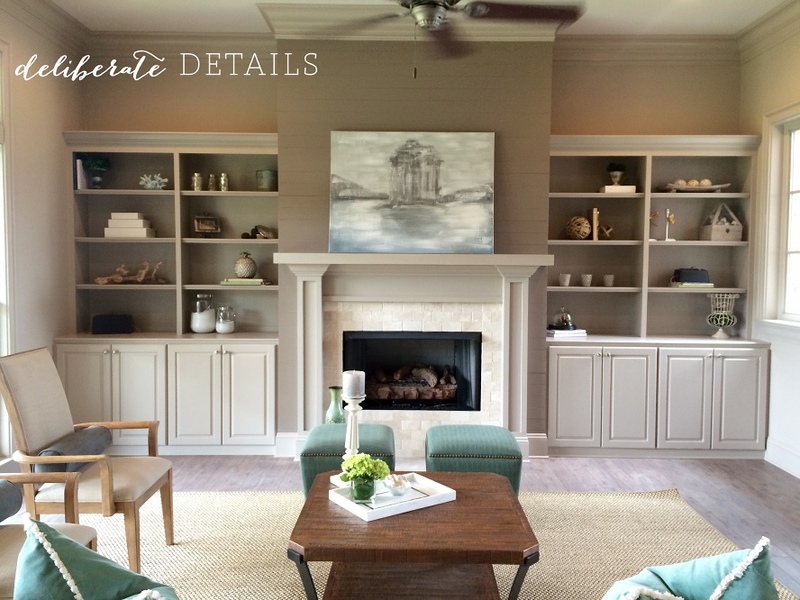 Staging built-in book cases can be a daunting task, so keep it simple! 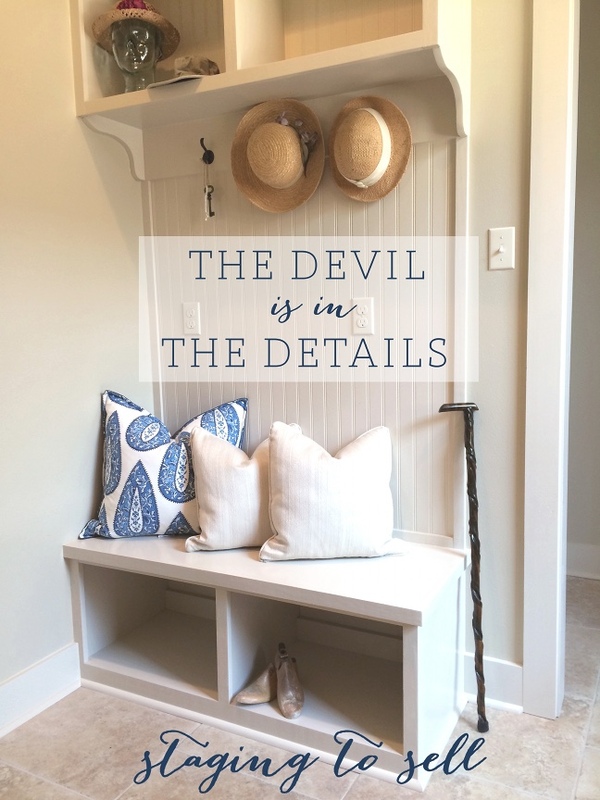 Built-in’s are a lovely detail that add character to a home, so it is important to stage them up! We want this special feature to embrace buyers and draw them in. I staged these shelves with a minimal amount of accessories and books to add interest without overwhelming the eye and distracting from the rest of the space. 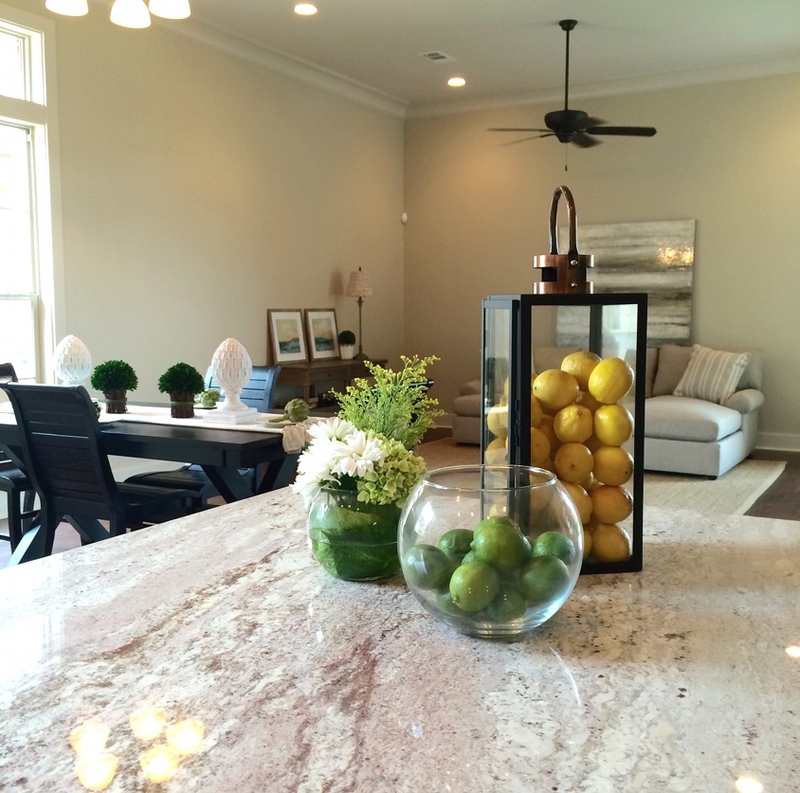 With a brand new home, we want to avoid potential buyers being overwhelmed by the scent of fresh paint. I like to burn candles for ambiance and aroma! The idea is to stimulate all the senses! Don’t stop at smell, nourish their taste buds as well! 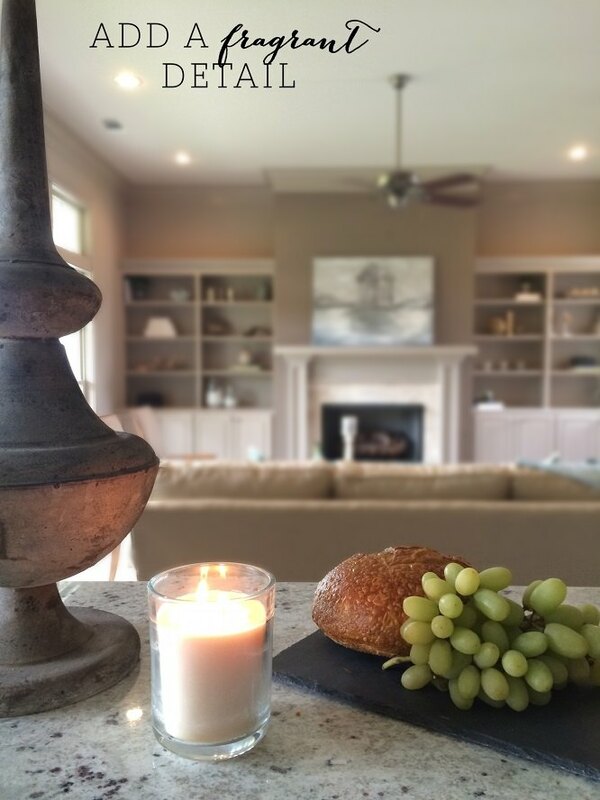 Setting out a cheese platter, baked goods, or even a bottle of wine encourages visitors to STAY, have a bite, and chat. And hey, chatter could lead to a sell! There she is…My lovely mother/friend/shrink/doctor/assistant/financial adviser…and today, my florist. So, there’s the skinny. Good luck to all of you and your future staging endeavors!